BTW: if you think we don’t speak up: check this, or if you think all terrorists are Muslim please do some honest research/ critically reflect on tabloid headlines … thank you. Peace. I’m working on a publication (more due to not being able to find anything on it rather than thinking I’m any professional at this!) on ‘Quran – an environmentalist’s extract’. Please share with me your favourite ‘green’ verse from the Quran and why… it was the environmental/ sustainability message in the Quran and Prophet Muhammed’s example that convinced me to become Muslim. In Ramadan 2014 have read the whole Quran again and reminded of how clear it is on our need to be humble about the way we use our surroundings: nothing is ours, created for our use… ‘our’ in the sense of current humanity and posterity, not greedy or as individual. And a page with some highlights as to why the Quran spoke to me: Reflect! Think! I am also compiling an overview of different Islamic declarations on environmental issues. If Islam makes you think ‘oh, that’s about stoning and chopping off hands’, PLEASE read THIS article before sending me any vile messages (unfortunately I’ve already received plenty). In 2009 I self-published a book on ‘199 ways to please God’ on Islam & environment (see under the environment page of this website). 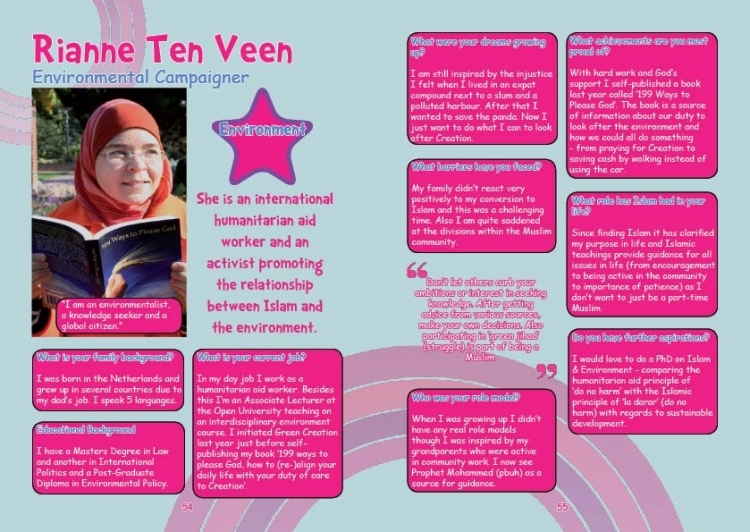 I was featured by Muslim Womens Network UK. In 2018 I participated in a Living the Change faith-inspired leadership course on living with integrity (our faith & actions). I was co-founder of the ‘Faith & Climate Change’ initiative at Birmingham Friends of the Earth.